Shoulder Bag (blue) by Soul Dichotomy at Diaper Bags Coach. MPN: 10454817. Hurry! Limited time offer. Offer valid only while supplies last. The concept of origami is the inspiration behind the folded silhouette. The vibrant colored bold print enhances the character of the shoulder bag. The concept of origami is the inspiration behind the folded silhouette. The vibrant colored bold print enhances the character of the shoulder bag. The spacious interior with no structure accommodates large items like towels, blankets etc. 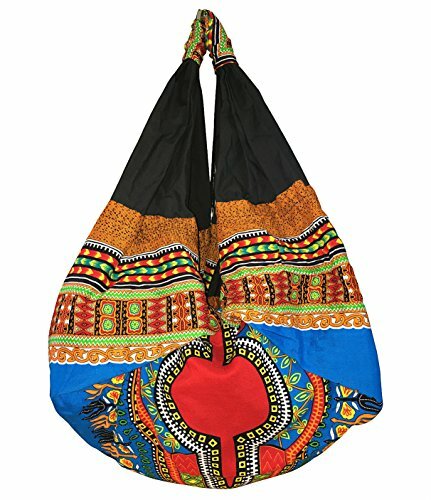 The bag can be used as a beach bag, diaper bag, picnic bag or shopping bag. Additionally, it has a side pocket for your convenience. Straps are wide and comfortable to carry any extra load. The bag base is padded adding extra comfort while providing structure. See our matching sarong, which can also be used as a scarf or head wrap, bedcover, tapestry. Care instructions: Dashiki print: Machine Wash Cold, Tumble Dry Low. Bandana print: Machine Wash Cold, Line Dry or Spot Clean. Closure: Fabric tie Outer fabric: 100% Cotton Lining: 100% Cotton Padded bag base: 100% Polyester Dimensions: open drop 19 inches, widest width 23 inches ( width varies due to folds), Total height 30 inches, Base padding 8.5 inches by 13 inches Note: Pictures show tie inside the bag. Bag can be rolled up and tucked away in another bag when not in use or, other bags can fit into the bag. If you have any questions about this product by Soul Dichotomy, contact us by completing and submitting the form below. If you are looking for a specif part number, please include it with your message.